Three children were among the dead. Nearly 90,000 customers were without electricity in Texas, Mississippi, Louisiana, Arkansas, and Georgia as of midday Sunday, according to www.poweroutage.us as the severe weather left a trail of destruction. Two children were killed on a back road in East Texas when a pine tree fell onto the car in which they were riding in a severe thunderstorm Saturday near Pollok, about 150 miles (241 kilometers) southeast of Dallas. The tree "flattened the car like a pancake," said Capt. Alton Lenderman of the Angelina County Sheriff's Office. The children, ages 8 and 3, were dead at the scene, while both parents, who were in the front seat, escaped injury, he said. At least one person was killed and about two dozen others were injured after a suspected tornado struck the Caddo Mounds State Historic Site in East Texas during a Native American cultural event in Alto, about 130 miles (209 kilometers) southeast of Dallas. Cherokee County Judge Chris Davis said the fatality that was reported was of a woman who died of her critical injuries. In neighboring Houston County, the sheriff's office said one person was killed in Weches, 6 miles southwest of Caddo Mound. There was widespread damage in Alto, a town of about 1,200, and the school district canceled classes until its buildings can be deemed safe. 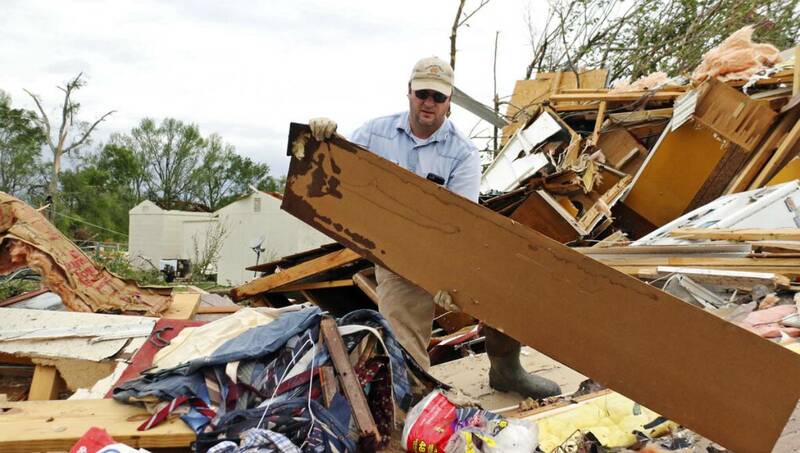 A tornado flattened much of the south side of Franklin, Texas, overturning mobile homes and damaging other residences, said Robertson County Sheriff Gerald Yezak. Franklin is about 125 miles (200 kilometers) south of Dallas. The weather service said preliminary information showed an EF-3 tornado touched down with winds of 140 mph (225.3 kph). It destroyed 55 homes, a church, four businesses, a duplex, and part of the local housing authority building, authorities said. Two people were hospitalized for injuries that were not thought to be life-threatening, while others were treated at the scene, Yezak said. Some people had to be extricated from damaged dwellings. Heavy rains and storms raked Mississippi into the night Saturday as the storms moved east. Roy Ratliff, 95, died after a tree crashed onto his trailer in northeastern Mississippi, Monroe County Road Manager Sonny Clay said at a news conference, adding that a tornado had struck. Nineteen residents were taken to hospitals, including two in critical condition. A tornado was reported in the area 140 miles (225 kilometers) southeast of Memphis, Tennessee, at the time. In Hamilton, Mississippi, 72-year-old Robert Scott said he had been sleeping in his recliner late Saturday when he was awakened and found himself in his yard after a tornado ripped most of his home off its foundation. His 71-year-old wife, Linda, was in a different part of the house and also survived, he said. They found each other while crawling through the remnants of the house they have lived in since 1972. "We're living, and God has blessed us," Scott, a retired manager for a grocery store meat department, said Sunday as neighbors helped him salvage his belongings. National Weather Service meteorologist John Moore said a possible twister touched down in the Vicksburg, Mississippi, area. No injuries were reported, but officials reported damage to several businesses and vehicles. The storm damaged a roof of a hotel in New Albany, Mississippi, and Mississippi State University's 21,000 students huddled in basements and hallways as a tornado neared the campus in Starkville. University spokesman Sid Salter said some debris, possibly carried by the tornado, was found on campus, but no injuries were reported and no buildings were damaged. Trees were toppled and minor damage was reported in residential areas east of the campus. As the storm moved into Alabama, a possible tornado knocked out power and damaged mobile homes in Troy, about 50 miles (80 kilometers) south of Montgomery. Near the Birmingham suburb of Hueytown, a county employee died after being struck by a vehicle while he was helping clear away trees about 2:15 a.m. Sunday, said Capt. David Agee of the Jefferson County Sheriff's Office. The man, whose name was not immediately released, died after being taken to a hospital. The forecast of severe weather forced officials at the Masters in Augusta, Georgia, to start the final round of the tournament early on Sunday in order to finish in midafternoon before it began raining. Three children were among the dead. Nearly 90,000 customers were without electricity in Texas, Mississippi, Louisiana, Arkansas, and Georgia as of midday Sunday, according to www. poweroutage.us as the severe weather left a trail of destruction.